The fruit of the amalaki tree has long been used by practitioners of Ayurvedic medicine for its properties in promoting digestive health. Unfortunately, there is not a lot of research to support these long-held beliefs as to how it could benefit a person who was experiencing chronic digestive problems. This overview will provide you with some basic information about this herbal supplement so that you can make an informed decision as to whether or not it is a product that you should be using. Ayurvedic medicine maintains that amalaki is helpful for a wide variety of health problems as it has a positive effect on many of the body's systems. If you do a quick Internet search you will find all sorts of health claims for amalaki, including healthy functioning of the liver, heart, brain and lungs. There are also claims that it can offer protection against cancer and well as give you shiny hair and clear skin. Unfortunately, there is little research to back up these claims. Of greater concern is that there is little research as to the safety of amalaki. Any research to date regarding amalaki's effectiveness has been conducted has involved animals, not humans. You can click here for a review of this preliminary research. It may be fair to say that amalaki is high in Vitamin C and antioxidants. When it comes to the effect of amalaki on digestion, the picture is quite muddy. In general, amalaki is thought to facilitate digestion, to regulate elimination, and to ease constipation. However, I could find no relevant research on the subject. More confusing is that some sources purport that amalaki has anti-diarrheal effects. What effects on the digestive system that amalaki actually has is far from proven. 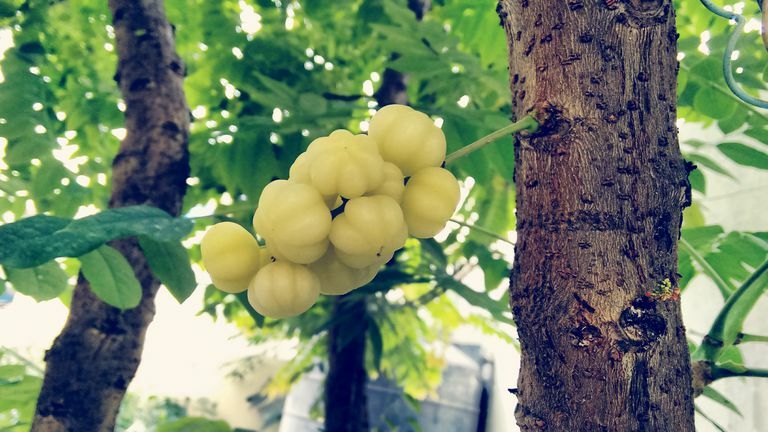 Amalaki is one of the three fruits used to make up the ayurvedic supplement known as triphala. The other two fruits that are used come from the bibhataki and haritaki trees. Triphala is typically prescribed by Ayurvedic practitioners for the relief of abdominal pain, bloating and constipation. There is a little more research on triphala's safety as opposed to amalaki, however most of the research on triphala's health benefits has been that of animal studies. Although amalaki has been used for centuries, so much is unknown about its safety, effectiveness, and impact on your digestive symptoms. It may be better to explore alternative approaches for managing unwanted symptoms. Don't forget the importance of consulting with your doctor before taking any herbal supplement or any other over-the-counter remedy. Krishnaveni, M. & Mirunalini S. "Therapeutic potential of Phyllanthus emblica (amla): the ayurvedic wonder." Journal of Basic and Clinical Physiology and Pharmacology 2010 21:93-105. Are You Imagining That Your Belly Gets Bigger as the Day Wears On?